The perfect greenhouse for novices and experts alike, The Halls Magnum 8 x 12-foot Greenhouse is a great combination of beauty and practicality. The Halls Magnum Greenhouse features cast joints and additional struts at the eaves and ridge to give this greenhouse extra strength. An additional six inches was added to the ridge and eaves to not only increase headroom, but also to make room for hanging plants. To make sure your plants are protected and won't burn, this greenhouse is made with strong and durable polycarbonate glazing to diffuse the light and has a UV resistant coating. The superb, 4mm thick doubled-panel twin walls have twice the heat retention of glass and include aluminum or plastic strips to prevent foreign objects from getting stuck in between the panes. The greenhouse has four roof vents for increased circulation and double doors that make it easy to bring in a wheelbarrow or wheelchair. 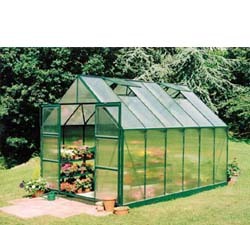 With a peak height of eight feet and measuring 8W x 12L x 8H feet, this greenhouse is a great choice. Assembly is a weekend project for one or two people.